All leaders operating in mountainous areas must be oriented and skilled in military mountaineering. The execution and success of the mission in mountainous operations depend on the level of individual and unit skill proficiency and conditioning. Only through practice and repetition do actions become reflexive and is the goal of high individual and unit proficiency realized. Personnel trained in mountain operations should form the cadre to train unit personnel. 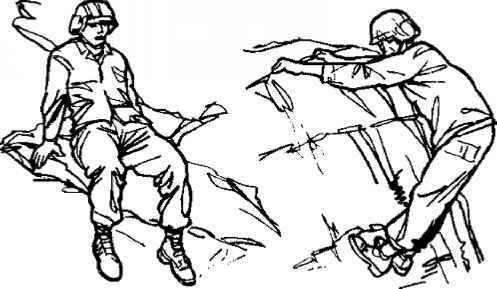 Before undertaking mountain operations it is mandatory to train all unit personnel in balance and party climbing. Units with a mountaineering mission should have two teams that consist of three expert rock climbers (assault climbers) for each platoon. The other unit members should be skilled in basic military mountaineering (mountain walking, balance climbing, knot tying, building of installations, and bridging). Preparation for mountain operations is not complete until the unit commander knows how all of his men will react to exposure to height and to the above-average physical effort. Each soldier is exposed to unknown dangers. The fear of falling is a human instinct and is hard to overcome. 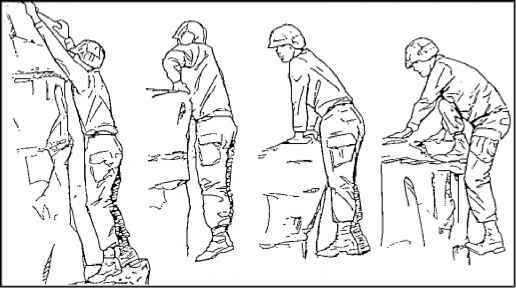 Analysis of a soldier's reaction to height allows the commander to place those who do not overcome such fear in a position where they will not endanger the lives of other unit members. A soldier cannot be forced to ignore his fear of height. Physical and psychological conditioning are not enough to produce competent climbers. The soldier must possess a will to climb. These two aspects, conditioning and will, combined with skill gained through practice, produce positive results. The art of mountain walking may mean relearning how to walk. Effective mountain walking includes the correct technique reinforced by experience. There are several techniques, however, all techniques have the same goal: safe movement over difficult terrain with the least expenditure of energy to arrive at a destination in good condition to complete the mission. Proper Technique. You must abide by several mountain principles to ease your movement over difficult terrain. These apply to all mountain walking techniques. • You must center your weight directly over your feet at all times. Place your foot flat on the ground to obtain as much (boot) sole-ground contact as possible. Then, place your foot on the uphill side of grass tussocks and other level spots to avoid twisting the ankle and straining the Achilles tendon. You should rest between steps by straightening the knee after each step. Take small steps at a slow pace. You must avoid steep angles of ascent or descent, and take advantage of any indentation in the ground. • As a mountaineer, you must set a tempo, or number of steps per minute, according to the rate at which the unit is moving. Since physical differences mean the tempos of two people moving at the same speed will not be the same, it is best that an interval of three to five paces is kept between individuals. This interval allows each person to adjust his stride for changes of slope or terrain, enhancing their tempo, pace, and rhythm. The people at the end of the file will benefit from this interval since the accordion effect will be lessened. • The terrain, weather, and light conditions affect the rate of climb. The more adverse the conditions, the slower the pace. Moving too fast, even under ideal conditions, produces early fatigue, requires more rest halts, and results in loss of climbing time. You will have greater endurance to climb if you are well conditioned and acclimatized. You can only move as fast as your legs will allow. The keys to successful mountain operations are: rest, good nutrition, proper conditioning and acclimatization, and the will to climb. • Breaks are kept to a minimum. When taking a rest halt, boot laces should be loosened and the body ventilated (through layer dressing). At the end of a day's/night's climb, a good rest is needed to revive tired muscles. • The rest step is used for steep climbing. The pace is kept slow and rhythmic. This slow, steady, halting rest step is more efficient than spurts of speed, which are rapidly exhausting and require longer recovery. Mountain walking is divided into four techniques dependent on the general formation of the terrain: walking on hard ground, grassy slopes, scree slopes, and talus slopes. • Walking on Hard Ground. Hard ground is firmly packed dirt that does not give way under the weight of a soldier's step. When ascending, your knees must be locked on every step to rest the muscles of the legs. Steep slopes can be traversed rather than climbed straight up. Turning at the end of each traverse should be done by stepping off in the new direction with the uphill foot. This prevents crossing the feet and possible loss of balance. In traversing, the full-sole (boot) principle is accomplished by rolling the ankle away from the hill on each step. For small stretches, the herringbone step may be used-ascending straight up a slope with toes pointed out. A normal progression as the slope steepens would be from walking straight up the slope, to a herringbone step, and then to a traverse on the steeper areas. When descending, you should move straight down a slope without traversing. Your back must be straight and knees bent so they take up the shock of each step. Your body weight must be directly over the feet, and the full-sole is placed on the ground with each step. Walking with a slight forward lean and with feet in a normal position make the descent easier. Grassy Slopes. They are usually composed of small tussocks of growth rather than one continuous field. In ascending, the upper side of each hummock or tussock is stepped on where the ground is more level than on the lower side. When descending a grassy slope, a climber should traverse because of the uneven nature of the ground. You can easily build up too much speed and fall if a direct descent is tried. The hop-skip step can be useful on this type of slope. In this technique, the lower leg takes all of the weight, and the upper leg is used only for balance. When traversing, the climber's uphill foot points in the direction of travel. The downhill foot points about 45 degrees off the direction of travel. This maintains maximum sole contact and prevents possible downhill ankle roll-out. • Scree Slopes. These consist of small rocks and gravel that have collected below rock ridges and cliffs. Scree varies in size from grains of sand to the size of a fist. Sometimes it occurs in mixtures of all sizes, but normally scree slopes consist of the same size particles. If possible, you should avoid ascending scree slopes since they are difficult and tiring. All principles of ascending hard ground apply, but each step is chosen carefully so that the foot does not slide down when weight is placed on it. This is done by kicking in with the toe of the upper foot so that a step is formed in the scree. After determining that the step is stable, weight is transferred from the lower to the upper foot. The process is repeated. The best method for descending scree slopes is to come straight down the slope using a short shuffling step with the knees bent, back straight, feet pointed downhill, and heels dug in. 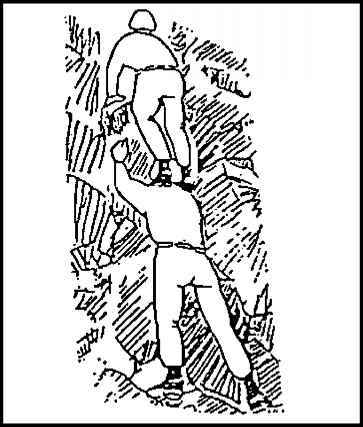 When several climbers descend a scree slope together, they should be as close together as possible, one behind the other about one arm's length apart, to prevent injury from dislodged rock. Scree slopes can be traversed using the ice axe as a third point of contact. Always keep the ice axe on the uphill side. When the herring-bone step is used to ascend scree, the axe can be used by placing both hands on top of it. The bottom (or point) of the axe is sunk into the scree, and the axe is used for balance. The climber uses the herringbone step up to the axe. The tendency to run down a scree slope is avoided so control is not lost. When the bottom of the route cannot be seen, caution is used since dropoffs may be encountered. • Talus Slopes. Talus is a slope formed by an accumulation of rock debris much larger than a man's fist When walking in talus, whether ascending or descending, always step on the top of and on the uphill side of the rocks. This requires the least amount of movement into the slope. Always use caution when moving in talus; large rocks can be held in place by smaller keystones; disturbing them can cause rock slides. Climbers must stay in close columns while traversing. 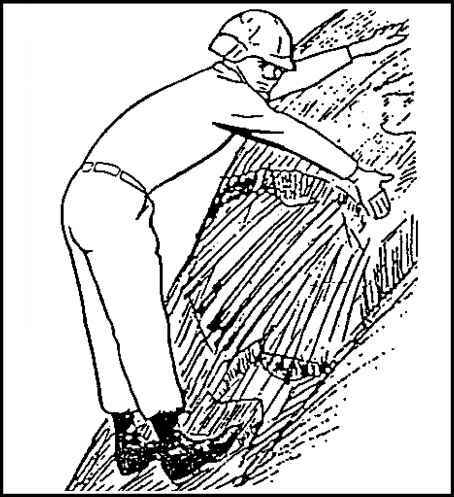 To prevent rockfall injuries, no member of the party traverses below another member. All other basics mentioned apply. The techniques discussed previously are precautions you may take to reduce the most common mountaineering hazard- rockfall. Whenever a rock is kicked loose, the warning, "Rock," is shouted immediately. Personnel near the bottom of a cliff immediately lean into the cliff to reduce their exposure, and they do not look up. Personnel more than 10 feet away from the bottom of a cliff may look up to determine where the rock is and seek cover behind an obstacle. Warning. Do not run downhill since personal injury could occur. If an ice axe is carried, it may be used as a third point of contact on difficult terrain. Otherwise, it is carried on or in the rucksack with its head down and secured. The same procedure applies if it is used on ice. Carelessness can cause the failure of a well-planned mission. One rock no bigger than a man's head can kill or severely injure several men and ruin all security measures. Stepping over, rather than on top of, obstacles such as large rocks or fallen logs help to avoid fatigue. Usually, a talus slope is easier to ascend and traverse, while a scree slope is a more desirable avenue of descent. Balance climbing is used to climb rock formations. As a climber, you must study the route you are to travel to ensure you have chosen the best route and have the proper equipment. Before starting an operation, you should mentally climb the route chosen to anticipate future events or incidents. • Eyes. As a climber, you must observe the entire route selected to climb. Use your eyes to climb the pitch. You should identify handholds and footholds, possible belay positions, alternate routes, rest spots, and a route for down climbing or descending. You must use your eyes continuously to look for cover, concealment, subsequent handholds and footholds, and rest positions, as well as to continue planning and revision of the route. Night climbing is facilitated by the use of night observation devices (NODs). • Body Position. As you move and climb, your body must be in balance; that is, your weight must be centered over your feet. Use your hands mainly for balance; support your body weight with your feet. If you lean in toward a rock, your feet will not hold well; you must keep your body out and away from the rock to counter the gravitational pull of the body. With your body in balance, move with a slow, rhythmic motion (Figure 3-2). If possible, you should maintain three points of contact with the rock, such as two hands and one foot. You must avoid a spread-eagle position since you must stretch too far and cannot let go without falling. When you reach a position of security, try to rest since tensed muscles tire quickly. Allow for circulation by keeping your arms as low as possible, and while you relax, plan your next move. When selecting handholds, you should keep your hands about waist-to-shoulder level. This allows you the desired upright, balanced position as well as resting your arms. It is preferred that you use small, intermediate holds rather than stretching and clinging to widely separated holds. Handholds may become subsequent footholds. Your arms or legs should not be crossed, nor should you use your knees or elbows as handholds or footholds. CASHWORTH. This acronym should help you remember proper procedures during balance climbing. C - Conserve energy. A - Always test holds. S - Stand upright on flexed joints. H - Hands are kept low; handholds should be waist-to-shoulder high. W - Watch your feet. O - On three points of contact; avoid using knees and elbows; avoid awkward, out of balance positions. R - Rhythmic movement. T - Think and plan ahead. H - Heels are kept lower than the toes and pointed inward. FIGURE 3-2. Balanced Body Climbing Position. Down climbing. During descents, you should face out where the moving is easy, sideways where it is hard, and face in where it is difficult. Holds are often not as visible as when climbing up (Figure 3-3). You must maintain a balanced stance by keeping the body weight over your feet. Make sure you look at each handhold and foothold for proper positioning. As in ascending, you should maintain three points of contact with the rock, such as two hands and one foot. The larger muscles, such as the thighs, should do the work, as opposed to calves. If possible you should avoid down climbing since it is very dangerous. 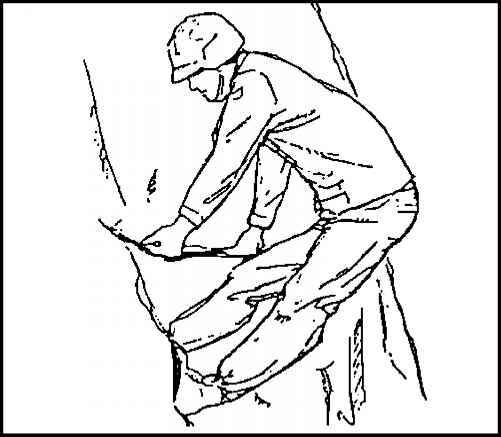 If anchors are available, rappelling may be quicker, easier, and more practical for descending. • Sound off with the command, FALLING. Push away from the rock face. Maintain proper body position. Head down, chin on chest. Hands shoulder-width apart and extended toward the rock. Feet kept below the body and shoulder-width apart. Extend the legs toward the rock. The only points of contact with the rock face should be hands and feet. This position prevents the body from bouncing off the rock and minimizes injury by reducing exposure to the rock face. All handholds and footholds must be selected based on their closeness and relative stability. You must test these holds by pulling, pushing, hitting, and kicking, and then by applying body weight gradually before use. You should not use your knees and elbows as holds since they tend to roll and are susceptible to injury. You should not use pitons, chocks, bolts, and runners as handholds and footholds since they may "pop" out. Snaplinks may impale you and cause severe injuries. You should not rely on grass, trees, and shrubs because their roots are shallow. You should not try to skip or jump from one position to another. It is best when traversing to use a hop step to change feet on a hold to move sideways easily. • Pull Holds. These holds are usually pulled toward the body and are the easiest holds to use but the most likely to break out (Figure 3-5). They are the most commonly sought handholds and tend to be overused. Pull holds need not be large to be secure. Some holds may accommodate only the fingertips, while others are large and rounded to fit the entire hand. • Friction Holds. These holds depend only on the friction of hands or feet against a relatively smooth surface with a shallow hold (Figure 3-6). They are hard to use, because they give a feeling of insecurity which the inexperienced climber tries to correct by leaning close to the rock. This, in fact, decreases the security of friction holds. These holds often serve well as intermediate holds. They can provide you the support needed while moving over them, but would not hold if you were to stop or slip. The effectiveness of this hold depends on the type of boot worn; type, condition, and angle of the rock face; and other factors. • Jam Holds. Jamming involves wedging fingers, hands, arms, elbows, feet, knees, legs, or any part of the body or extremity into a crack (Figure 3-7). 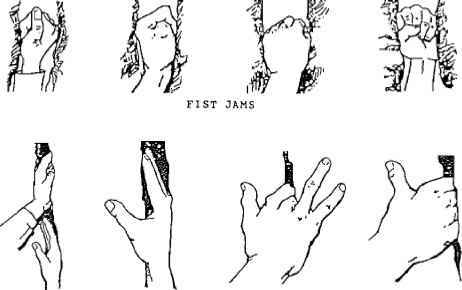 Jamming can be accomplished by putting the hand into the crack and clenching it into a fist or by putting an arm into the crack and applying a cross-pressure force with the elbow against one side and the hand against the other side. You must take care that your body part does not become so wedged into the crack that it cannot be removed easily. Jam holds are often more secure than other types of holds, and provide an effective means of ascending or down climbing. Narrow cracks are good for fingertip and toetip jams. Medium cracks require hand, fist, and foot jams, with or without cross pressure. Wide cracks are large enough for arms and legs but not for the entire body. A crack wide enough for the entire body is referred to as a chimney and requires stemming techniques. • Footholds. On steep slopes, the body should be kept vertical, using the small irregularities in the slope to aid friction (Figure 3-8). Footholds less than 2 cm (3/4 inch) wide can serve as intermediate holds, even when they slope out. Skillful footwork in rock climbing is essential. The feet should always be carefully positioned with the eyes inspecting placement. You should make as much sole-to-surface contact as possible. 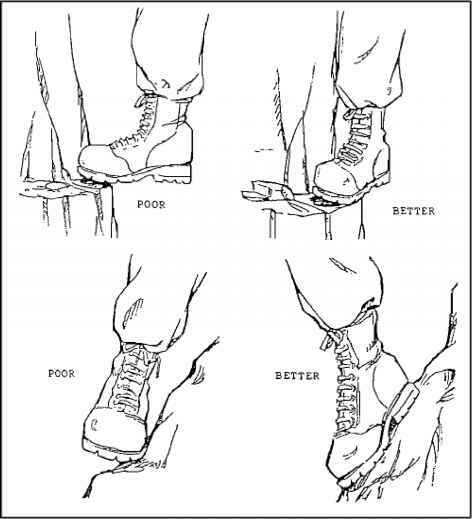 If you are wearing stiff-soled combat boots, your foot should be turned sideways so the edge of the boot is on the hold; if you are wearing flexible rock shoes, you should capitalize on the friction and flexibility of the shoe, and "smear" downward with the toe pointing uphill. You must avoid crossing your feet; If you must change your feet, use the "change step." Making maximum use of footholds-climbing with the feet and legs-is an effective means of conserving upper body strength, since leg muscles are stronger than arm muscles. If your legs are tired and vibrating, you should regain your balance and straighten your leg(s), allowing the muscle to relax and restore proper circulation. • Combination Holds. These holds are combinations and variations of the basic holds previously discussed. The number of these variations is limited only by your ability, imagination, and resourcefulness. 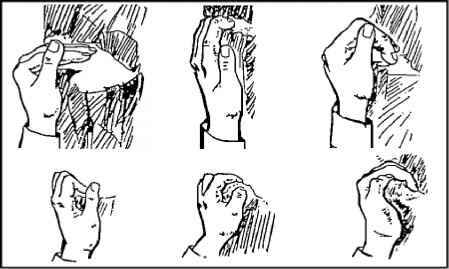 The pinch hold is attained by pinching a protruding surface between the thumb and fingers (Figure 3-9), or pulling outward or pressing inward with the arms. The push-pull hold, as the name implies, involves using a push hold and pull hold at the same time (Figure 3-9). A cross pressure hold is accomplished by pressing the hands toward each other on a rock protrusion or by placing both hands in a large crack and pulling in opposite directions (see Figure 3-9). The lie-back hold is performed by leaning to one side of an offset crack (see Figure 3-10) with the hands pulling and the feet pushing against the offset side. It is a strenuous technique that involves placing the hands in the crack, placing the feet against the offset side, and leaning back with the arms fully extended while pressure is applied with the feet. The arms should be extended so that there is weight on the bones while the muscles can rest. An ascent is made up the crack. The hands slide up the crack but are not crossed. The feet should be kept about shoulder-width apart and shuffled upward, using friction and available footholds to maintain balance. Inverted pull hold (see Figure 3-11) and inverted push hold, sometimes called underholds or underclings, permit cross pressure between the hands or feet. This involves pulling up on a hold with the hands while downward pressure is applied with the feet on a suitable foothold. FIGURE 3-11. Inverted Pull Hold. Performing a mantel (Figure 3-12) requires using two pull holds at one time to raise the body. As the body is raised to chest level, the handholds are used to push down to elevate the body the rest of the way up. A foot is lifted up on the ledge and the climber stands up. A mantel is most easily accomplished on a ledge. The hop-step or change-step is used when a climber wants to switch feet on the same foothold without an intermediate hold so that he may move sideways. This technique requires two solid handholds since the climber has both feet temporarily off the rock. The feet are changed with a slight upward hop followed by precise footwork. 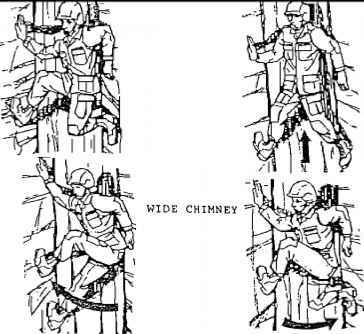 Chimney climbing (Figure 3-13) is used to exert cross pressure between the back and the feet, hands, or knees. The entire body is inserted into a crack in the rock. By using both sides of the opening and possibly all types of basic holds, the climber moves up the crack. These techniques rely on the friction that is maintained by cross pressure with the body. As many points of contact as possible must be maintained. 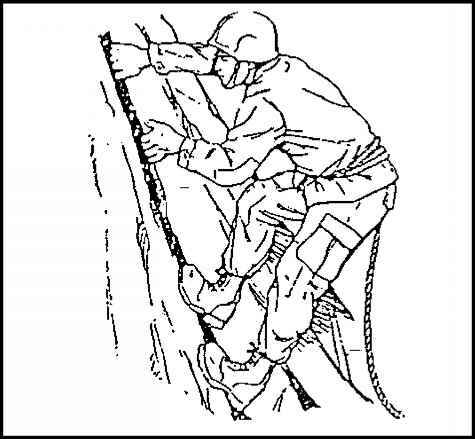 Stemming is similar to chimney climbing; however, the climber extends both legs to use footholds by pushing in a sideways direction (cross pressure). This provides a good position to rest the arms. Use of Holds. The use of a hold is just as important as the hold itself. A hold need not be large to be safe. Experienced climbers use holds so small that the inexperienced climber may not notice them. The climber learns to plan each move he makes. Before making a move, he knows exactly where his hands and feet are going to be placed. He must also plan what his action(s) will be if he tries a move that does not work. All handholds and footholds are tested before use by gradually applying weight. Intermediate holds are handholds or footholds that are awkward or uncomfortable to maintain, but allow you to shift your weight to a better hold. Shoulder Stand. The shoulder stand or human ladder is used to overcome a lower section of a pitch that lacks holds to reach the climbing above. 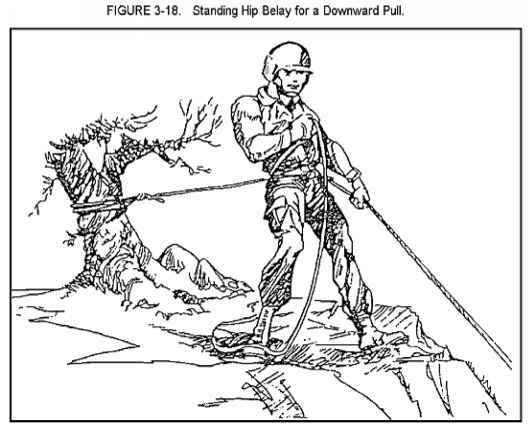 When climbing roped together, the lower man is anchored to the rock and belays the leader, who uses the lower man's body as a ladder to overcome a difficult section. Movement on slab. A slab is a smooth portion of rock, laying at an angle (Figure 3-15). When traversing, you should stand erect with the lower foot pointed slightly downhill (45-degree angle) to increase balance and friction of your foot. The uphill foot must point in the direction of travel. For added friction, you should use all irregularities in the slope. It may be necessary to squat with the body weight well over the feet. Hands are used beneath the buttocks for added friction. This resembles a crab position and may be used for ascending, traversing, or descending. Your weight should be maintained evenly over your hands and feet; leaning back or letting the buttocks drag reduces friction and a slip may result. On a high-angle slab, you should face in toward the rock in a well-balanced position with your weight centered over the feet, since your weight is carried almost entirely by friction footholds. Use the full sole of your boot as much as possible. You should avoid slab covered with ice, moss, or scree, or that is wet since it is dangerous. Precautions. As a climber, you must always be aware of a margin of safety and observe all safety rules. • Margin of Safety. This is the protective buffer a climber keeps between what he knows to be the limit of his ability and what he actually tries to climb. You learn your margin of safety by climbing near ground level, or by being tied to a rope and belayed by a trained nay above (top rope). You climb first on the easy holds, next on the more difficult holds, and finally on difficult pitches until you reach your limit of ability. You should calculate the margin of safety not only for the pitch immediately ahead, but also for the entire climb, thus avoiding situations beyond your abilities. In the leadership position, you should know the abilities of your men and make allowances for their limitations. Wear a helmet with the chin strap fastened when climbing on loose rock. Keep the soles of boots clean and dry. Always clean the boot soles before starting a climb by kicking the feet against the rock. If wearing cleated boots, use a stick or some pointed object to clean out the cleats. Avoid lunging or jumping to reach a hold. Carefully check all handholds and footholds before use to ensure they are not loose. Never dislodge loose rocks carelessly or intentionally; if a rock becomes dislodged, warn climbers below immediately by calling out, "Rock." Use the same warning for any falling object except for a falling climber, use "Falling." Voice signals are normally not used in a tactical situation. Do not look up when the warning, "Rock", is heard from above. Immediately seek shelter or flatten against the surface. Tie into the climbing rope on all exposed areas. Anchor all belay points. Remove watches, rings, and other jewelry from the hands before climbing; it can cause severe injuries when stuck in a crack. 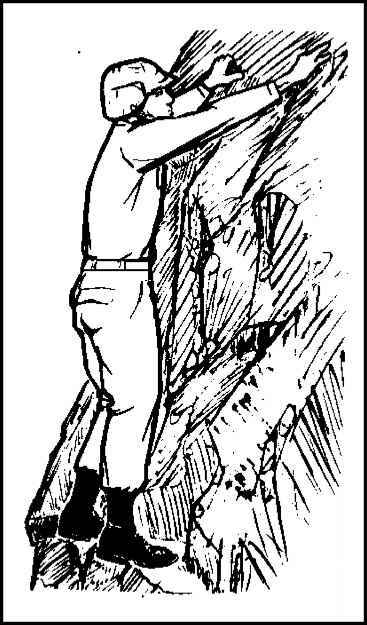 Use care and common sense when climbing on wet rock. Some types of rocks can be extremely slippery when wet. If vegetation must be used as a hold, test them like any handhold since they have shallow roots. Avoid using elbows and knees. This creates a ballbearing effect on the rock, which causes the climber to be off balance. Moreover, these joints may slip and cause severe body damage. When a climber falls, shout the warning, "Falling", to those below. When falling, remain under control both mentally and physically. Retain proper body position and try to avoid excessive contact (hands and feet only) with the rock. In initial training or when trying difficult moves low to the ground, use a "spotter" to assist in breaking a climber's fall.